The ellman Surgitron® dual-RF 4.0 MHz device is shown in Fig. 43.3 and the procedure is demontrated in Video 43.2. The patient is anesthetized, orally intubated and a David-Meyers mouth gag inserted to get a good overview of the tonsils all the way down to the lower pole Two neutral electrodes (antennas) are placed one under each shoulder. One of the electrodes is connected to the machine. The tonsils are inspected and checked for superficial blood vessels. 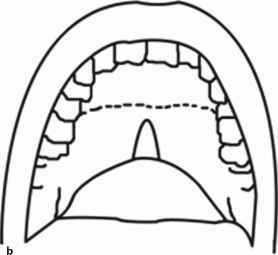 On the posterior side you should also check to see if there is a cleft between the tonsil and the posterior pillar and how deep it is. Local anesthesia including a vasoconstrictor (0.25% Mar-cain-epinephrine) is injected into the tonsillar tissue. It should be injected slowly in order to avoid leaking of the solution out through the crypts. Depending on the child's age and the tonsil size, 2-5 ml is used in each tonsil (Fig. 43.4a). Surgery is begun on the side where the antenna is connected. A 2-cm-wide gauze strip is placed into the grove between the tonsil and the posterior pillar in order to protect the posterior pillar (Fig. 43.4b). A needle electrode is attached and the Surgitron® is activated. You should look for superficial vessels and coagulate these using 10-W coagulation mode. Change to cutting mode and increase the output to 15 W. Make an incision parallel with the anterior pillar without holding/pulling the tonsil. Try to go over the upper pole (Fig. 43.4c). Pull on the tonsil with forceps so the incision opens up a little. Change to cut/coagulation mode with 40 W and cut through the tonsil with a smooth movement down to the gauze which protects the pillar (Fig. 43.4d). If there was no grove between the tonsil and the posterior pillar to push the gauze strip into, cut through half of the tonsil first, stop, lift it upwards and do the final cutting from behind. Take an ordinary tonsillar swab and press for about 1 min against the remaining ton-sillar surface. Which pillar to protect tonsillectomy?